The quest for the aszú berry (noble rot and shrivelled grapes that become even more concentrated on the vine) - the soul of the great Tokaji sweet wines - means that in some vintages three to four passages (or tries) are made through the vineyards to collect these precious berries. The botrytis concentrates all that is created in the grape, its essence and value: alongside the sugar is acidity, tannins and aroma compounds, setting the foundation for naturally sweet wines. 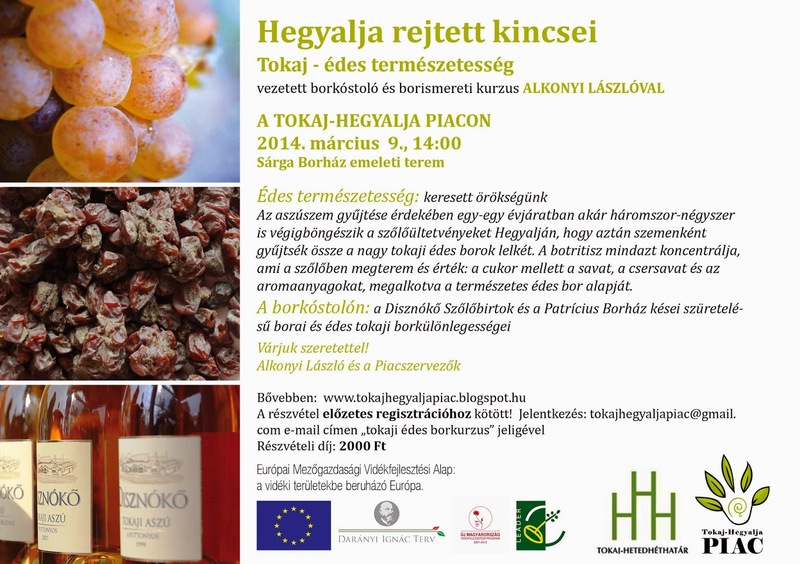 At the wine tasting this Sunday: Disznókő and Patrícius late harvest and Aszú wines. Just look at this wine flight for a treat! This is a rare treat indeed. If you'd like to particpate, please write us an email to tokajhegyaljapiac@gmail with "wine course” as subject. Translation into English available if anyone needs it!